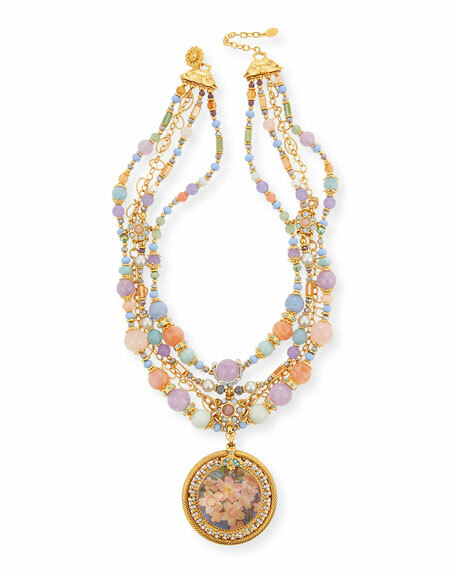 Jose & Maria Barrera pendant necklace. 24-karat yellow gold plating over brass. Four strands of mixed stones and beads. Amethyst, quartz, amazonite, carnelian, aventurine, dyed jade and glass pearls. Detachable decoupage on shell pendant. Lemon pendant necklace by Elizabeth Cole. 24-karat yellow gold plated brass hardware. Golden box chain with lemon and flower drops. Lemon pendant necklace by Elizabeth Cole. 24-karat yellow gold plated brass hardware. Golden box chain with lemon and flower drops. Baked enamel, acrylic beads and clay flowers. Approx. 32"L. Lobster clasp. Made in USA. Senso™ Collection pendant necklace by Ippolita. Handcrafted in 18-karat yellow gold. Round wavy disc pedant with white diamonds at center. Ippolita pendant necklace from the Starlet Collection. Polished 18-karat yellow gold chain and hardware. Integrated white diamond mini cloud pendant. Ippolita pendant necklace from the Starlet Collection. Polished 18-karat yellow gold chain and hardware. Integrated white diamond mini cloud pendant. Approx. 15-17"L; 0.6"W pendant. 0.45 total diamond carat weight. Adjustable; lobster clasp.